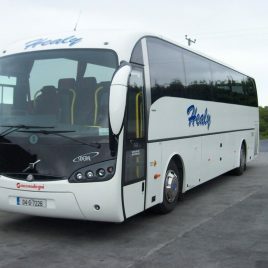 Operating in Galway since 1974, Healy Coaches provide private hire, tours and commuter services to the general public. Ideally situated for touring in the West of Ireland, Burren & Connemara regions. We are committed to providing a personal high quality service ensuring that your use of our service will be a pleasant and memorable experience. You can see our fleet of buses from the side link. As we travel from Galway we take the scenic coast road along the coast of Galway bay. One can see across the bay the Burren and the Aran islands unfold. Passing through Spiddeal our first stop is at Standun’s sweater and souvenir shop for a coffee and refreshment. The tour then heads down to the Deserted famine village, an area heavily populated before the Great Famine. Travelling through the Connemara rugged landscape, the stacks of turf, the Connemara ponies and the crannogs begin to unfold. Arriving at Maamcross, the replica of “The Quiet Man cottage” unfolds starring John Wayne was filmed near here. Now we are entering the wild beauty of Connemara, mountains start to rise and there are vast open breath taking spaces in the Maam Valley, a spectacular region that divides up the Maamturk mountains of Connemara. Dropping down into the village of Leenane where the film “The Field” directed by John B. Keane was filmed, Killary Fjord (Ireland’s only fjord) unfolds. Here it is visible to see the salmon and mussel pots floating on the surface of the water where the fish are farmed here. Arriving now at the highlight of the tour, Kylemore Abbey & Gardens,one can absorb the tranquil atmosphere while walking in one of Ireland’s most peaceful scenic areas. This is also the lunch stop on the tour. Heading back to Galway by the Inagh Valleyan area of scenic and unsurpassed beauty, the lakes of Inagh which are rich for fishing begin to unfold in amongst the twelve Bens mountains. Travelling back along the main N59 Galway to Clifden road the tour follows the leafy banks of Lough Corribin by the village of Oughterard, often referred to as “the gateway to Connemara” arriving back in Galway at 5pm approx.